"A breathtaking story of a family in the midst of chaos, struggling with all they have to stay strong despite the horrible events all around them. Febles has written a gripping tale that presents the tragic impact that the Castro Regime had on all aspects of life, for so many families – both then and now. Highly recommended!" The Columbia Review. 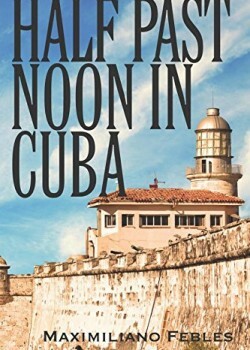 “Half Past Noon in Cuba” by Maximiliano Febles is a historical novel that presents the story of the Cuban Revolution through the eyes of one Cuban family. It will be of great interest to history aficionados, particularly those interested in Cuban history or politically oppressive regimes. “Half Past Noon in Cuba” focuses on the story of the Buendia family. Dr. Buendia was a well educated, anti-communist university professor – successful and very much in love with, and loved by, his wife, Ana Buendia. They had created a vibrant life in the center of Havana, Cuba in the 1950s and were incredibly blessed in terms of their lifestyle, their passion for living, and their many exciting adventures. During their glory years, the couple enjoyed all of the glamour and excitement that the city had to offer. Unfortunately, the Buendia’s happiness did not last. When the Castro Regime took over the country, their lives would forever change. Like many of those around them, the Buendias were shockingly oppressed, trying to fight back against the tyranny to no avail. The Buendias were particularly targeted due to Dr. Buendia’s position as an anti-communist academic, and the devastation that resulted would never be forgotten. With “Half Past Noon in Cuba,” author Maximiliano Febles delivers a breathtaking story of a family in the midst of chaos, struggling with all they have to stay strong despite the horrible events all around them. Febles has written a gripping tale that presents the tragic impact that the Castro Regime had on all aspects of life, for so many families – both then and now. Highly recommended!